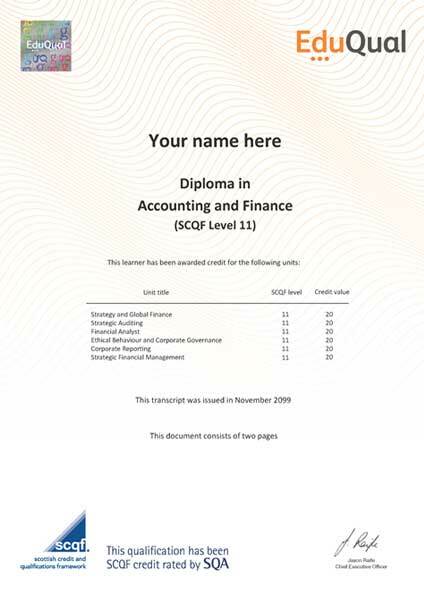 The Diploma in Accounting and Finance (SCQF Level 11) is a 120 credit size qualification consisting of 6 compulsory units and is a Regulated Qualifications Framework (RQF) equivalent Level 7 qualification. The Diploma in Accounting and Finance offers those learners with relevant experience, and/or an honours degree supported by aptitude/potential, the knowledge and skills they need to be operationally effective in a career in the fields of accounting and finance. For those learners that have prior experience in accounting and finance and who also possess a professional qualification, the pathway through this programme will develop their professional competence. The Diploma in Accounting and Finance consists of 6 mandatory units for a combined total of 120 credits. This Diploma is recognised by the Institute of Financial Accountants (IFA), an Ofqual-recognised awarding body and a globally-recognised professional membership body. Holders of the EduQual Diploma can now apply for Associate Financial Accountant(AFA) membership status of the IFA, enjoying a significantly reduced membership fee. Holders of the EduQual Diploma in Accounting and Finance (SCQF level 11) can also obtain exemptions from four (of six) examinations from the AIA Certificate in Accountancy . This certificate is the first stage of the AIA Professional Accountancy Qualification. Holders of this qualification can join a variety of UK degree programmes at an advanced stage. Degree top-up programmes can be delivered in the UK, locally, or by-distance/online.